The club continues to have success in bringing Atlantic salmon back to their native waters. This year, for the first time, we received reports of adult Atlantic salmon being caught in all three sections of the East Branch of Fish Creek &- below Kessinger dam, above Swancott Mills dam and between the two dams. The Club ordered 45,000 eyed eggs from the hatchery in Casco, Maine. The eggs were ready in early January, 2012 due to a warm fall and earlier egg take at the hatchery. After last year's egg shipment was damaged in transit, the decision was made to drive to the Hatchery in Casco and pick up the eggs ourselves. Paul Miller volunteered, and with his wife Diane, drove to Casco and brought back 45,000 eyed eggs in excellent condition. The club ordered fewer eggs than in past years because with the requirement to test the fish for disease, the fish are larger when stocked and this requires more space for the fish to prevent over crowding A fourth tank was donated to the hatchery and the club made the necessary modifications. Club members set up and manned the display booth at several sports shows over the winter, spring, and fall. 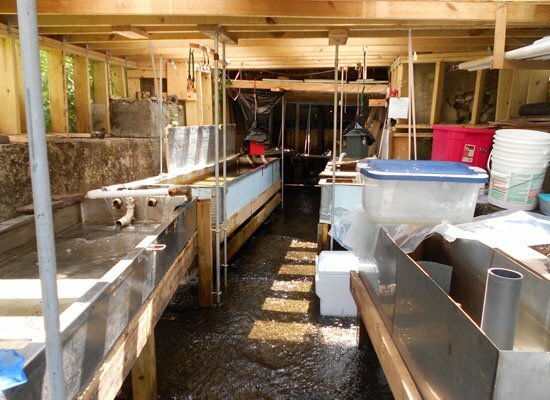 The club's mission to restore Atlantic salmon to their native waters was explained to visitors. At each show, more and more people stopped to say they have heard of our work and support our efforts. We also received several reports of our fish being caught. Tom Schneider again ran the raffle and collected prizes. Raffle tickets were sold at each show, and the winning tickets were drawn on May 24. The club's hatchery at the McConnellsville Dam continues to have the support and interest of the Harden Furniture factory. Paul Miller designed and built new covers for two of the tanks. The covers are a corrugated clear plastic with removable insulation boards. The insulation is left in place until the eggs hatch, and then removed to let the light in through the clear cover. They look like tanning beds for salmon. Jim Lawler built several new egg trays to replace older ones. A hatchery schedule was developed by Paul for picking eggs and tending the hatchery. The schedule included: Paul and Dave Miller, Mike Mercoldie, Pete Renne, Jim Morris, Arley Morey, Jim Lawler, Paul Wenham, Tom Schneider, and Ted Collins. The eggs are checked every day and dead ones removed so they don't spread any disease to the remaining eggs. After the eggs hatch and begin feeding, feeders are monitored and excess food vacuumed from the bottom of the tanks. We lost a large number of fish this year during the transition from feeding on yolk sacs to eating fish food. This critical period will be watched closely and ground fish food will be offered in an attempt to get the fish to take solid food sooner. This years stocking was conducted over two days, June 30 and July 1, and was well attended. Geoff Schaacke, organizer of the Spey Nation initiative, visited our hatchery on Saturday June 30. Geoff helped stock fish and was given a guided tour of the watershed by Gary Bartell. 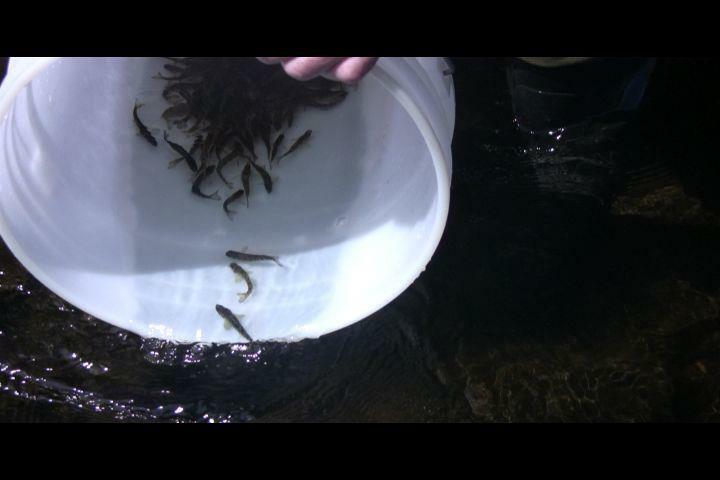 Tunison Labs in Cortland has been rearing fingerling Atlantic salmon for release in the Oswego River. On Friday October 5, Tom Schneider, Arley Morey and Jim Lawler helped with stocking Tunison's salmon in the river behind the Altmar Hatchery. The Spey Nation event was held July 14 at Pineville, and proceeds from prize raffles at the event were again donated to the Club. Our affiliation with the Spey Nation event continues to be very rewarding. They have been our biggest benefactor and the contacts developed have been very helpful. We also talked with Jill Alcott from the Atlantic Salmon Federation and discussed our plans for a Strategic Planning Initiative. For some time the club has felt that a more scientific understanding of the Fish Creek system would give us a better idea of how effective our stocking program has been, and what we could do to improve on it. During discussions with Jill Alcott of the Atlantic Salmon Federation, she recommended that a strategic planning study be undertaken to describe our goals and the steps necessary to achieve them. She offered the Federation's resources to help with implementation. Our first attempts resulted in the following Strategic Goal - To develop a science-based understanding of the natural and human influenced conditions of the Fish Creek System in order to engage other users and the public in efforts to enhance water quality and habitat for cold water species including Atlantic salmon, native and non-native trout. It was felt that the field work and analysis required for the study would be a good project for a college graduate student, similar to Margaret Murphy's work earlier. We met with Margaret and Neil Ringler of ESF at the hatchery to discuss our goals and a potential project. Neil will be canvassing graduate students and develop a proposal. Jeff Maharan, a new member and graduate of Paul Smith's College, offered to assist with the strategic planning effort and suggested a good start would be a redd count to locate spawning Atlantic salmon in Fish Creek. A field trip to three sections of the creek did not locate any redds (active nesting site with eggs), but further trips are planned. 2012 was a very busy and productive year. Reports of adult Atlantic salmon being caught in Fish Creek and Oneida Lake continue to increase. The coming year will include more efforts to locate juvenile and adult salmon and progress the Strategic Planning effort. This to ensure that Atlantic salmon maintain a permanent presence in the Fish Creek system.